The Crimson returns to the win column after a disappointing loss to No. 15/14 Cornell the night prior. The Crimson completed a season sweep of the Raiders on Saturday afternoon after dropping both contests to Colgate in 2017-2018. 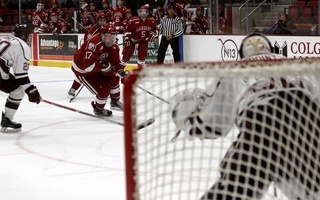 Both the Harvard men’s hockey team and conference foe Colgate suffered shutout losses on Friday night. On Saturday afternoon, a battle between the two teams gave each a chance to right the ship. 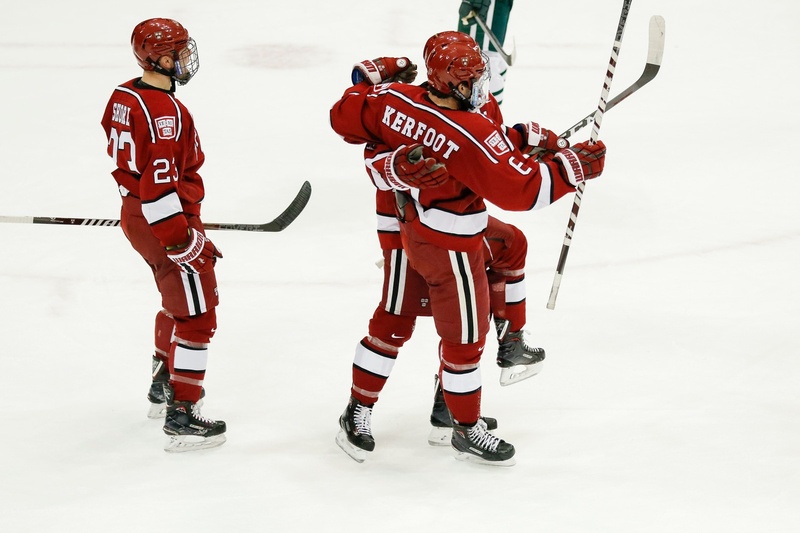 The Crimson (8-6-3, 5-5-2 ECAC) entered the matchup looking to bounce back from a disappointing defeat at the hands of storied rival Cornell, and the Raiders (6-14-2, 3-5-2) hoped to shake a three-game skid leading up to the bout. 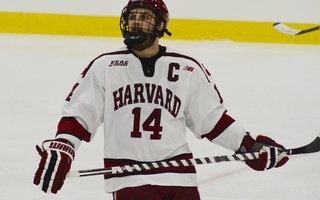 Of course, only one team could improve upon its prevailing storyline, and that team was Harvard, ousting Colgate to the tune of 2-1. Around the halfway point of the contest, the visitors added to a 1-0 lead that it owned courtesy of an early-first-period powerplay goal. After junior forward Nathan Krusko forced a turnover on the forecheck, he moved the puck to freshman blue-liner Jack Rathbone at the point. The Vancouver Canucks prospect sent a low shot toward rookie goaltender Mitch Benson, and the puck found its way through traffic all the way across the goal line. Junior Colton Kerfoot potted his second career goal and first since Oct. 27 in his team's 2-1 triumph. Scorers initially credited Rathbone with the tally, but upon further review, the puck ricocheted off junior forward Colton Kerfoot’s skate as he crashed the net to screen Benson. Rathbone’s primary helper is his first point of 2019, snapping a five-game drought for the offensively talented rearguard. Kerfoot picks up his first goal since Harvard’s season-opener at Dartmouth back in late October, in which he potted his first ever collegiate puck. 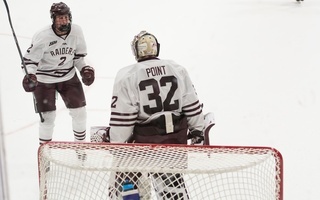 The fortuitous score proved to be the game-winner, as Colgate finally broke through senior net-minder Michael Lackey with eight minutes remaining in the tilt, spoiling his shutout bid. A solid Raiders shift ended with senior defenseman Willie Brooks burying a feed from sophomore blue-liner Nick Austin. The puck, which beat Lackey over his right shoulder, rung off the inside pipe and rocketed back out of the cage, confusing players and fans alike for a brief moment. 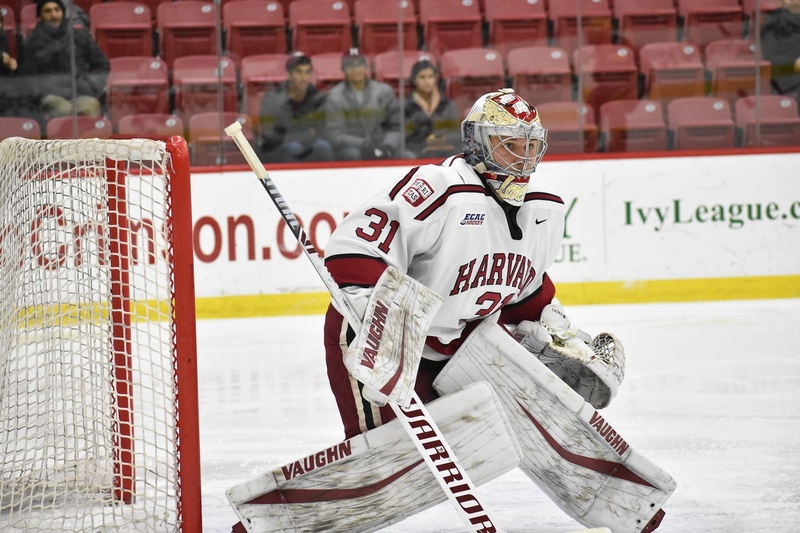 Harvard net-minder Michael Lackey has run away with the starting job after a few lackluster early-season performances, posting very sturdy numbers in his last 13 games. Nevertheless, the goal counted, cutting the Crimson lead to just one shot and forcing the visitors to bear down for the rest of the period. Despite ceding Brooks’ snipe, Lackey still shone, posting 29 saves in the winning effort. The backstop has now allowed two goals or fewer in 11 of his past 13 appearances, and the marked improvement in his numbers (8-5-3, 2.22 GAA, .923 SV%) shows it. The skaters in front of Lackey have also made strides in their commitment to defending. 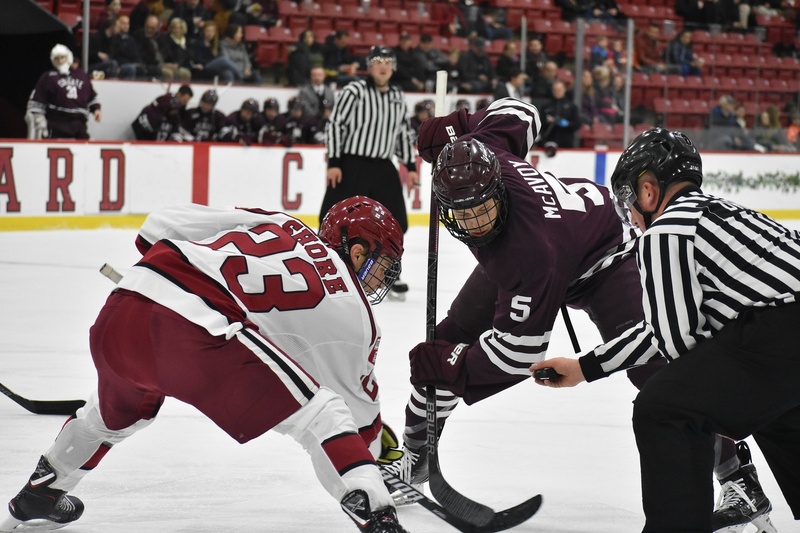 The Crimson powerplay, entering the weekend as the nation’s most effective unit at 35.7 percent, was held in check at the Big Red’s Lynah Rink on Friday night. The following day against the Raiders, however, it was Harvard’s man-up cohort that opened the scoring. 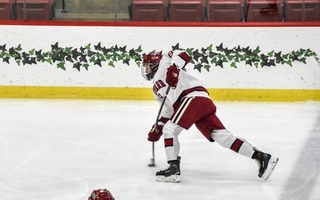 Just five seconds into the Crimson’s first powerplay opportunity of the night, junior defenseman Adam Fox fired a wrist shot toward the net, which was redirected by freshman forward Jack Drury. 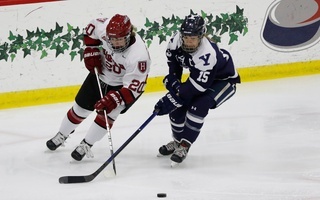 The early strike — a mere three minutes into the contest — helped Harvard officially put Friday’s disappointing performance in the rear view. Freshman center Jack Drury drew first blood on Saturday afternoon, nabbing his fourth powerplay goal of the season. Drury’s deflection marks his sixth of the season and fourth of the powerplay variety. He and fellow rookie Casey Dornbach, who drew the high-sticking penalty resulting in the goal, have been welcomed additions to their team’s lethal man advantage, combining for 22 powerplay points. The schedule ahead for the Crimson does not slow down. A visit from “North Country” foes No. 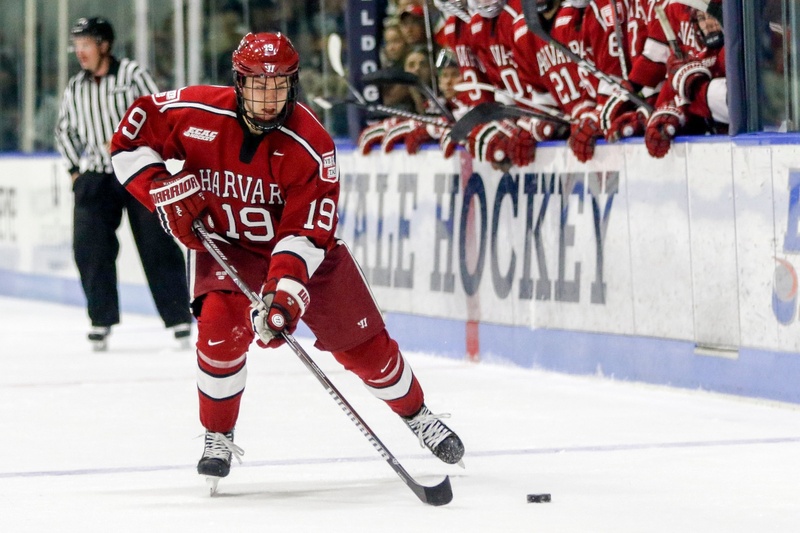 14/15 Clarkson and St. Lawrence, plus the annual Beanpot Tournament, will be crucial challenges for a Harvard team looking to string together wins and better its positioning in the standings.